First attempt at recording two of my original melodies. Although I have the precise dynamics/rhythm/note lengths written down on paper, this is a loose, casual playing. I do make some mistakes relative to how I would ideally play the pieces (a little overboard with too fast vibrato at some points, incorrect note length and rhythm, etc. ), but it'll do for now! And please excuse sound quality (cell phone). Interesting stuff you gots going there. Intense > very well played > What are the thoughts behind the music? What are you saying with each piece? Ah, so the story behind these. They're based on two poems I've written that serve as the first two in a set, which is why musically they blend together; it's supposed to be hard to tell where "En route" ends and "Vibrations" begins. Many of the pauses and sudden changes are strategically coordinated to go with the ends/beginnings of stanzas which I could theoretically recite (like a time warped minstrel), but I haven't figured that much out yet. 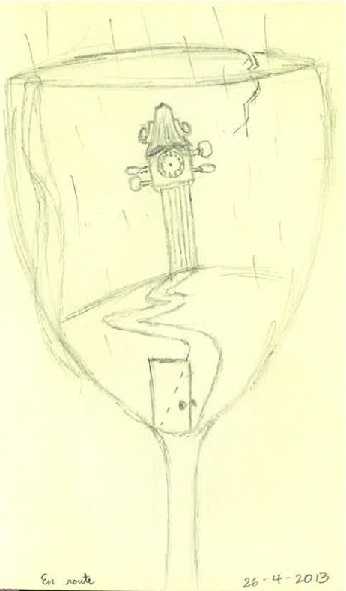 As for the poems themselves, they're in French and in flux, but I did scan a sketch I made for "En route" a while back, so at least one can maybe visualize what I was going for with that one...? Very interesting work of ART. Is the door a way out or a way in? Or does it swing both ways? The glass > is it a liquid surface the walkway is on? That is a glass > correct? The Viddle sort of looks like Big Ben with all kind of chambers in it. That is some SWEET stuff. Or maybe iits a blossom of some sort. > In a far off thought. Sorry for the late response! I've spent the past week moving 2,000 miles to the Windy City, so I've been chaotically discombobulated. The music does partially come from improvisation. What happens is that I fiddle somewhat randomly, often while a little tipsy, happen upon a combination I like that fits with something else I've already done, remember it, refine it, and later write it. Excerpts of the music are put together like building blocks, mixing and matching and reworking until I get the sound I'm looking for in regards to the thematic ideas in my head. So it's a bit of both improvisation and calculation. As for what's in the drawing, it's open to all potential interpretations! I really want to do a refined recording of this, with a mic that's capable of properly capturing violin, getting undertones and doesn't hiccup on loud E string notes (that's not me screeching in the video, I swear!). Two days ago my new neighbor in the building knocked on my door while I was practicing, told me I'm really good and asked if he could listen a little. I played En route/Vibrations, to a more exacting standard than here, and he was most impressed by it and that it was an original composition. And I was glad to be working through my nerves in front of an audience a little more.